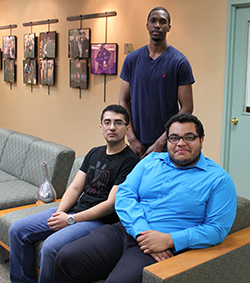 Congratulations to students Joseph Gonzalez, Garwayne McGregor, and David Rivas as they were accepted to participate at Clemson Institute for the Study of Capitalism. This is America’s first and only University-based teaching and research center dedicated to exploring the moral foundations of capitalism. Joseph, Garwayne, and David will join students from across the U.S, as well as international students and spend time with professors, activists, and other experts on liberty to study the foundations of a free society. Attendees walk away with a better understanding of what capitalism and morality are and how to effectively fight for them. The Clemson Institute for the Study of Capitalism holds its annual conference for undergraduate and graduate students at Clemson University in Clemson, South Carolina. This conference is co-sponsored by the Foundation for Economic Education. The institute accepts students, age 18-24, who are new to economics and the freedom philosophy and are interested in learning more about the world around them.